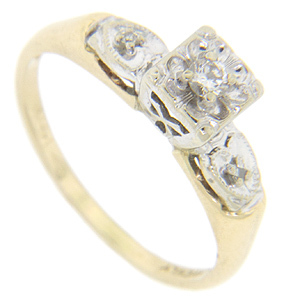 Heart shaped designs set with diamonds ornament the shoulders of this 14K bi-color gold retro-modern engagement ring. 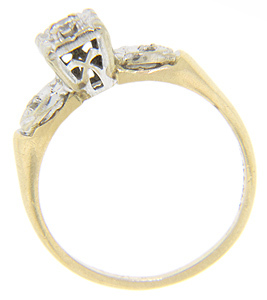 The top portion of the ring is realized in 14K white gold while the vintage ring’s shank is crafted of 14K yellow gold. The square head of the ring measures 6mm in width. Circa: 1940. Size: 7 1/4. We can resize.